Amazon brings Alexa to new Fire 7 and HD 8 tablets | What Hi-Fi? Amazon's updated tablets have better screens, sharper contrast and better battery life. 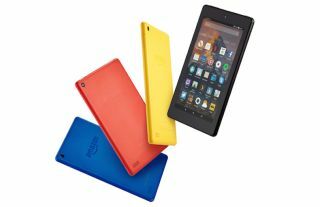 Amazon has announced updated versions to its Fire 7 and all-new Fire HD 8 tablets, making them slimmer, improving the screens and delivering Alexa capability. Both the new Fire 7 and the Fire HD 8 tablets have, respectively, the same 7in and 8in displays as their previous incarnations, but Amazon says it has made improvements to contrast and sharpness. The tablets have dual-band wi-fi and an extra hour of battery life - meaning eight hours for the Fire 7 and up to 12 hours for the HD 8. In terms of raw storage, the Fire 7 starts at 8GB with support for 256 GB of expandable storage, while the Fire HD 8 starts at 16GB. The most interesting new feature either tablet is, undoubtedly, support for Amazon's voice asistant Alexa. Unlike the Echo or the Echo Show, however, it has to be activated by holding a button on the table rather than by voice (to save battery power - having the tablet constantly listening is a drain). If you want to get Alexa on your existing tablets, you can - the update is available now, for all Fire tablets as far back as 2014's Fire HD 6. Pricing remains the same: Fire 7 is £50, while Fire HD 8 is £80. They're available in black, red, blue and yellow, and both devices will start shipping on 7th June. MORE: Amazon Echo vs Google Home – which is better?